Alma (KFSM) - The so-called skill positions may get all the flashy headlines, but for Alma football, 2018 comes down to the trenches. "I mean it all starts up front, everything we do starts up front," says senior Zac Henson, "so just having everybody back, all the leaders back, is really a big deal for us." Coltin Bowerman, another senior, agrees. "Probably one of the best offensive lines that we’ve had here, they all did a great job last year, and they’re all coming back this year, so we feel pretty confident about them." 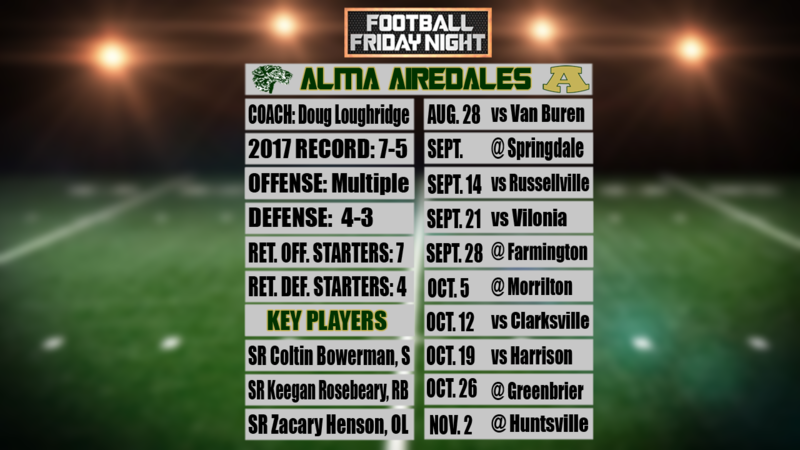 The Airedales return four starters on the offensive line, and that gives them a good feeling about the upcoming season. "You know, our offensive line having that much experience is going to be really important for us, especially early," says head coach Dough Lougheridge. "So having great senior leadership up front, and their backups being seniors and having all that experience is going to be big"
Henson, one of those returners on the line, thinks the years this group has spent together is a big upside. "Offensive line is all about trust, and we know what to do, and that helps really a lot." Experience up front becomes especially important with Alma breaking in a new quarterback, says Henson. "We’ve just got to be with our quarterback and help him a lot, with this being his first year as a starter, so we’ve just got to be with him and help lead the team more." "They’re gonna be able to protect Tanner and he’s gonna have a lot of time back there and he’s gonna be able to make good decisions," adds Bowerman. "He’s our dude and we’re confidant with him and we feel confidant in our O-line." On the defensive side of the ball, the Airedales look to shore up a unit that struggled last year to put together complete games, says Bowerman. "We just have to get off to better starts," says the safety. "The first half we would play really crappy, and then we would have to play catch-up in the second half." Loughridge says that the defense "needs to improve their mentality overall to become the aggressors." He thinks that could be a key as the Airedales go for their third straight conference championship. It all starts in the annual Battle of the Bone, Tuesday against rival Van Buren.